Results of extensive lab tests of samples of stem rust have shown that the 2016 stem rust epidemics in Sicily were caused by a new, highly virulent variant of race TTTTF. The samples were collected during serious and unusual outbreaks of wheat stem rust on both durum wheat and bread wheat in Sicily during April – June 2016. The epidemics were estimated to cover several thousands of hectares resulting in high inoculum load that could pose a threat to surrounding wheat areas in the forthcoming 2017 crop season, if environmental conditions prove suitable. Growers in at risk areas should be aware of the possible risk (on both durum and bread wheat), monitor crops for the early appearance of stem rust and undertake timely control if necessary. Unusual, early stem rust infections (at heading stage) were first detected by Dr Biagio Randazzo on April 19th 2016 in experimental plots at Ciminna, Palermo province. High and unusual levels of yellow rust were observed as well. It is unknown if rust was extensively present in surrounding areas prior to this first detection. Low levels of stem rust were observed at Ciminna at the end of the previous season (June 2015) and a mild winter may have contributed to the early infections in 2016. The majority of wheat breeding lines being tested at Ciminna showed high susceptibility to both rust diseases. Samples of rust infected leaves and stems were sent to the Global Rust Reference Centre (GRRC), Aarhus University, Denmark for race analysis. In the GRRC report: Samples of stem rust infected wheat from Italy, a single race of stem rust was reported among the 16 samples investigated – race TTTTF using the North American nomenclature – but additional virulence on resistance gene Sr13 and others were also identified. This is one of the few races known to be virulent to the combination of resistance genes Sr9e and Sr13, both being common sources of resistance in many durum wheat varieties. Although it should be noted that Sr13 virulence has been previously reported from Turkey. Race TTTTF has complex virulence, but is not related to the Ug99 race group and it is avirulent on genes Sr31, Sr24 and Sr25. Similar races have been detected in nearby regions and appear to be spreading rapidly, isolates from these regions are currently being investigated and compared with isolates from the Sicily epidemic. Yellow rust samples from Sicily revealed three races including a new one with a wide virulence spectrum (see – New races caused epidemics of yellow rust in Europe, East Africa and Central Asia in 2016). Rust samples were also sent to the John Innes Centre, UK for genotyping, and analysis is still on-going. Results on maps and charts are available from the GRRC, Aarhus University and RustTracker, CIMMYT. 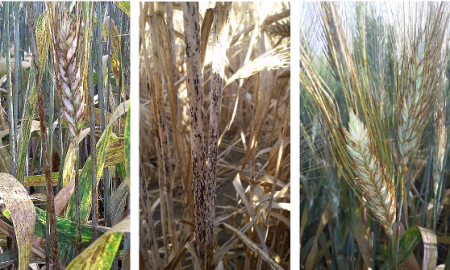 Field surveys undertaken by Dr Biagio Randazzo in the provinces of Palermo, Agrigento, Trapani and Caltanissetta resulted in an estimated area of 20,000-30,000 ha infected with yellow and stem rust. Yellow rust appeared first and was most severe in many cases. Highest incidence and severity of stem rust was observed in Palermo province (40-60% average severity and incidence of more than 50% in inspected fields), followed by Agrigento (30-40% average severity), then Caltanissetta (20-30% average severity). 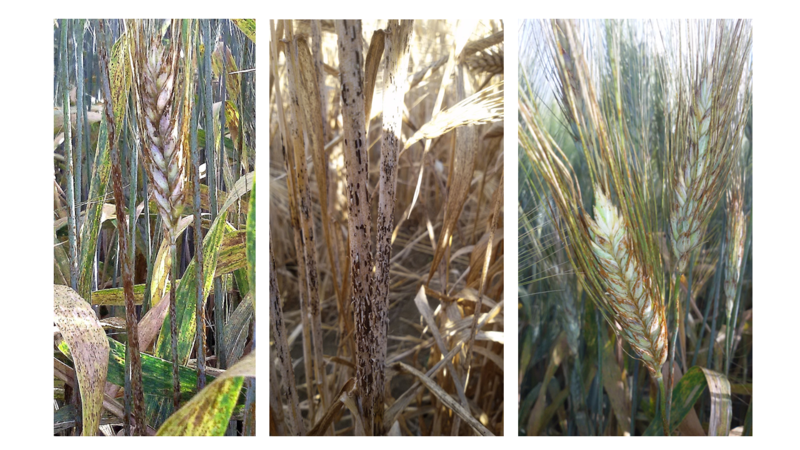 Stem rust was recorded at low severity and incidence in Trapani and also reported from Catania and Enna. The extensive area covered by the 2016 stem rust outbreak in Sicily makes this one of the largest stem rust outbreaks in Europe in several decades. Major commercial durum cultivars, notably; Simeto, Iride, Dulio, Core and Saragolla were all susceptible (see Figure 1). The large area infected by stem rust in 2016 will have produced a huge number of spores, making both dispersal and persistence into the 2017 season a likely possibility. Over-winter survival and suitability for early infection are both critical determinants, but are current unknowns. However, it is certain that large areas will have been planted to susceptible varieties in 2016/17. Major regional commercial durum wheat varieties are known to be susceptible, but many bread wheat varieties may also be vulnerable. If stem rust race TTTTF persists and environmental conditions are conducive for early infection then there could be a real risk of repeated outbreaks in the 2017 crop season. Figure 2: Relative proportions of total monthly viable spore deposition in May and June 2016, based on the site of first detection in Sicily. Source: Cambridge University and UK Met Office. NB: Spore dispersal models were optimized for Puccinia graminis f.sp tritici the causal agent of wheat stem rust. Using advanced, wind borne spore dispersal models i.e., the UK Met Office NAME model, scientists at Cambridge University and the UK Met Office have derived likely spore dispersal patterns from the Sicily outbreak. Figure 2 illustrates the relative proportions of total monthly viable spore deposition for May and June 2016, based on the site of first detection. Red and orange areas in the maps in Figure 2 illustrate where the probability of Pgt-spore deposition is highest. However, spore transport to light green areas is also possible (stem rust). Dispersal patterns showed a general tendency for spore movement in a North-east to South-east arc. Areas with the highest probability of spore deposition include; within Sicily, Southern regions of Italy (especially the extreme south-west) but also the slight risk to countries on the Eastern sea-board of the Adriatic (western Greece, Albania, Montenegro, Bosnia and Herzegovina, Croatia, Slovenia), along with northern Libya and north-east Tunisia. Dispersal modelling outcomes are subject to uncertainty; indicating where there is a higher probability of stem rust showing up in the areas listed above but it is not definite and the disease could occur elsewhere but with lower probability. Spores of yellow rust are less likely to survive long atmospheric travel times than stem rust, but there is still a risk of long-distance airborne transmission. Farmers and relevant authorities / institutions should be aware of the risk of stem and yellow rust on susceptible varieties in 2017. Early and regular scouting should be undertaken in areas at risk and on susceptible cultivars. Farmers should be aware of recommended control practices for stem rust and undertake early control using registered fungicides. If stem rust appears at an early growth stage, then timely control is critical if losses are to be avoided. Early application on initial infection foci can help preventing further spread of the infections. Any stem rust outbreaks should be reported to relevant authorities. Reports of stem rust to the global rust monitoring system / BGRI are also encouraged. Within the frame of ongoing Danish and international wheat rust initiatives, and after prior agreement, GRRC can to a certain extent receive and diagnose samples of rust-infected leaves and stems in 2017. However, additional diagnostic capacity is needed to meet a serious epidemic situation across larger regions in Europe. Screening of varieties for resistance against new races should be undertaken and the most rust susceptible varieties should be avoided.